Bernar Venet is a French Conceptual artist known for his curved, mathematically precise metal sculptures, and for his material exploration of coal, asphalt, and tar. “My work is self-generated. Nothing around me serves as a particular inspiration,” Venet said of his art. “I work, and I make discoveries while remaining open-minded to anything that might present a new possibility in the context of my work; this framework looks to enlarge its scope as a result of new formal and conceptual discoveries.” Born on April 20, 1941 in Château-Arnoux-Saint-Auban, the painter and sculptor studied at La Villa Thiole in Nice in 1958 for a year before pursuing a career as an artist. Friends with Arman, Jean Tinguely, Donald Judd, and Sol LeWitt, Venet worked within Minimalist and Conceptualist modes during the 1960s and 1970s. Awarded the Chevalier de la Legion d’Honneur in 2005, in 2012 he collaborated with the car manufacturer Bugatti to create a unique piece which was debuted at the Rubell Family Collection at Art Basel Miami. The artist established the Venet Foundation in 2014, which serves as a museum and archive of his oeuvre. He currently lives and works between New York, NY and Le Muy, France. Venet’s works are held in the collections of The Museum of Modern Art in New York, the Art Institute of Chicago, Fotomuseum Winterthur in Switzerland, and the National Gallery of Art in Washington, D.C., among others. Bernar Venet first gained recognition in the 1960s for the development of his Tar paintings, Relief cartons, and his iconic Tas de charbon (Pile of Coal), the first sculpture without a specific shape. The year 1979 marked a significant turning point in Venet’s career, when he began a series of wood reliefs, Arcs, Angles, Straight Lines, and created the first of his Indeterminate Lines for which he was awarded a grant by the National Endowment for the Arts. Over the following decades his work has been exhibited extensively throughout Europe, the United States, South America and Asia both in solo museum shows, as well as in major art events such as the Kassel Documenta in 1977, and the Biennales of Paris, Venice and São Paulo. To date he is the most internationally exhibited French artist with 30 public sculpture exhibitions and monumental works permanently installed in cities including Auckland, Austin, Beijing, Berlin, Cologne, Denver, Geneva, Neu-Ulm, Nice, Paris, San Francisco, Seoul, Tokyo, and Toulouse. 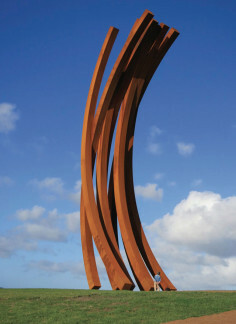 Venet has been the recipient of many awards including the Grand Prix des Arts de la Ville de Paris and Chevalier de la Légion d’Honneur, France’s highest decoration. In February 2016, the International Sculpture Center will award Venet the 2016 Lifetime Achievement Award for his exemplary contributions to the field of sculpture.